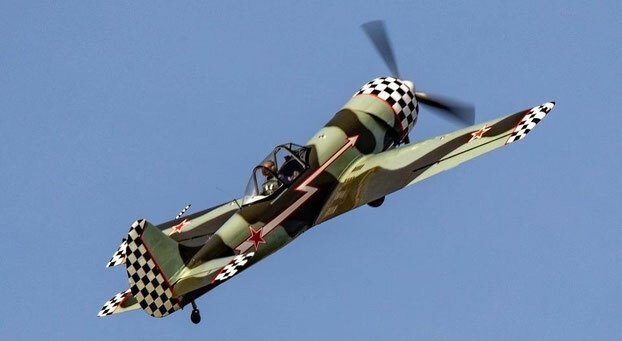 Developed by the famous WWII Russian fighter design bureau, Yakovlev OKB, the YAK-50 was conceived from the outset to dominate the world aerobatic competition scene in the mid 1970's. A further evolution of the storied 1940's YAK-18 lineage of aircraft, many enhancements were made to the design to improve both aerobatic performance and strengthen the airframe to be able to withstand the extreme demands placed on the aircraft throughout the unlimited aerobatic flight envelope. With superb maneuverability and a powerful 9-cylinder radial engine, the YAK-50 has the ability to put on a high energy aerobatic display, all while keeping the show right in front of the judges at competitions and the fans at airshows. A true thoroughbred, the YAK-50 boasts some impressive performance numbers. With a top speed of 450 km/h, a roll rate of 200 degrees per second, and the ability to withstand +9G, this Russian classic is still a formidable competitor. Our YAK-50, affectionately named '(To Be Announced)', was built in 1976 behind the iron curtain of the Soviet Union. After winning multiple aerobatic contests, she was sold to a private collector in Australia. Geoff had the great fortune to acquire this unique and historic aerobatic aircraft in the spring of 2019.